The story started with the picture on the right. 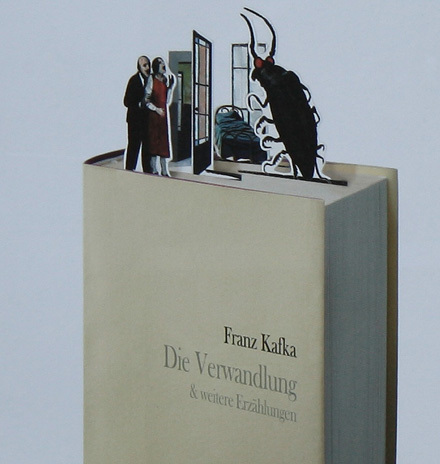 Cutout bookmarks stick out of a hardbound edition of Kafka's Metamorphosis, and they obviously depict figures from the story. 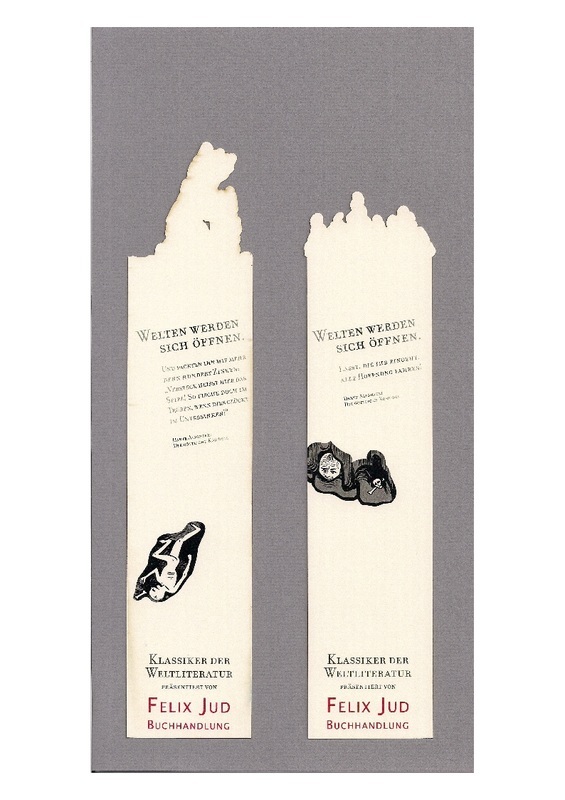 A friend of mine had seen this picture in a book about advertising, and knowing that I am an enthusiastic bookmark collector, she came and showed it to me. My interest was stirred and I began with investigations on the web. 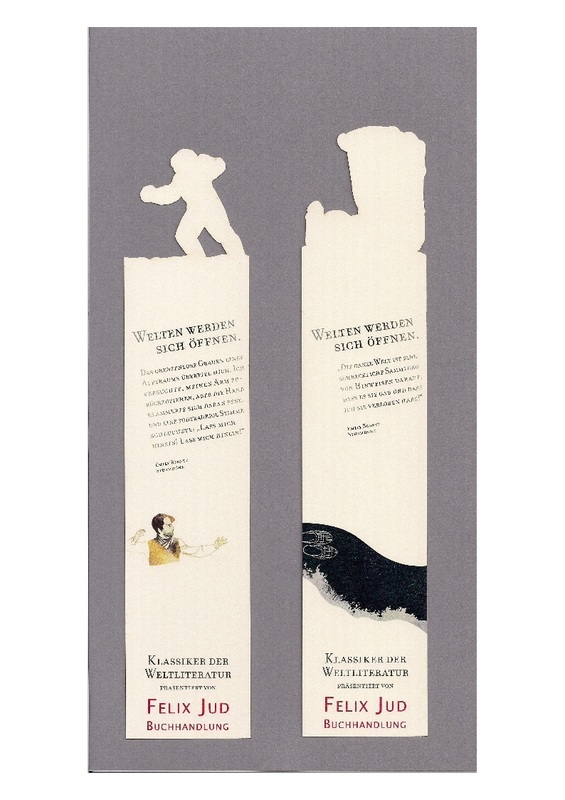 The traces soon led to the Felix Jud Bookshop in Hamburg, Germany, They were the publishers of the Kafka bookmarks: a traditional house selling books since 1923, also engaged in publishing and art trade. 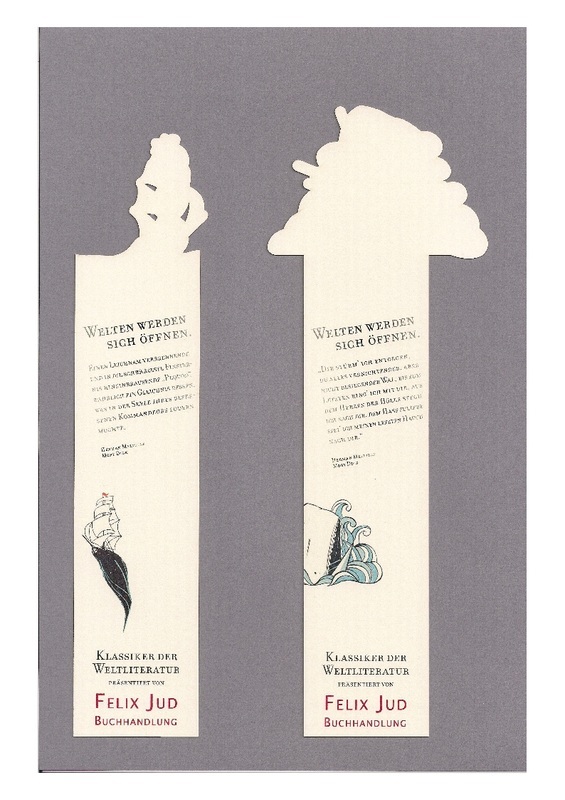 As it turned out, Felix Jud is one of the most distinguished bookstores in Germany, and a very remarkable place. 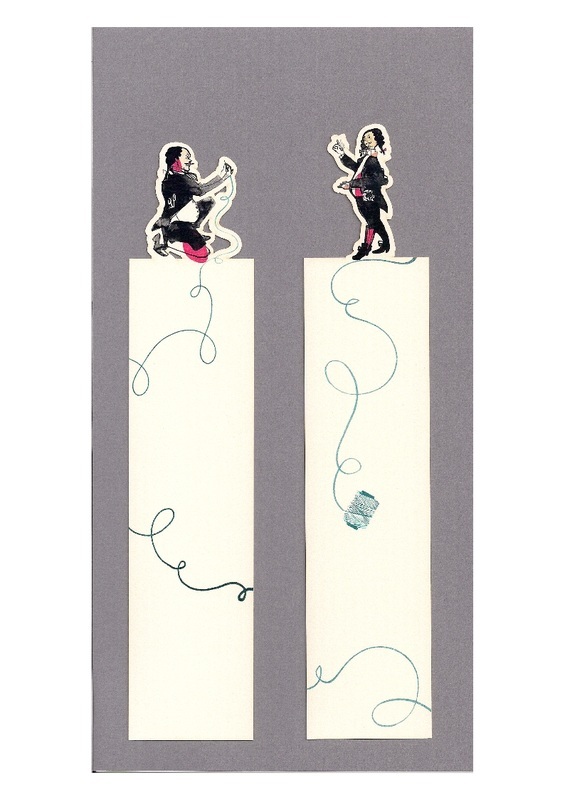 They have created an image of exceptionality by combining literature and art in a unique way and filled it with vibrating life, events, well-known artists and authors from home and abroad. 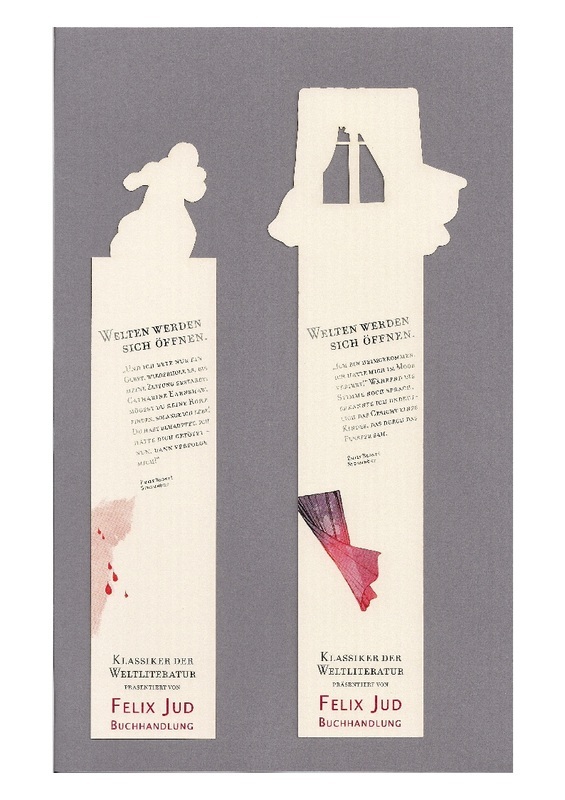 Excellence seems to be their guiding principle, thus they had not printed the Kafka bookmarks by themselves but commissioned them to one of the largest and reputed advertising agencies in Europe: Scholz & Friends with headquarters in Hamburg and Berlin. 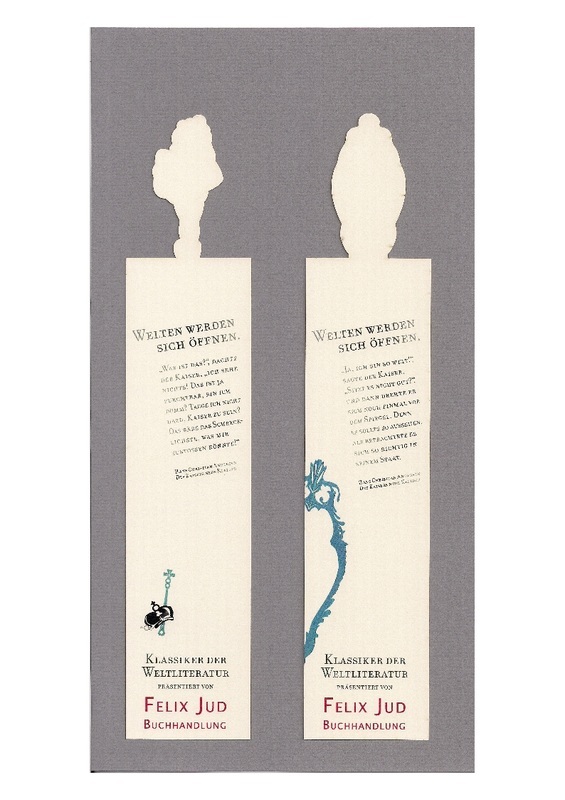 I called the company Scholz & Friends in Hamburg to ask about the Kafka bookmarks. 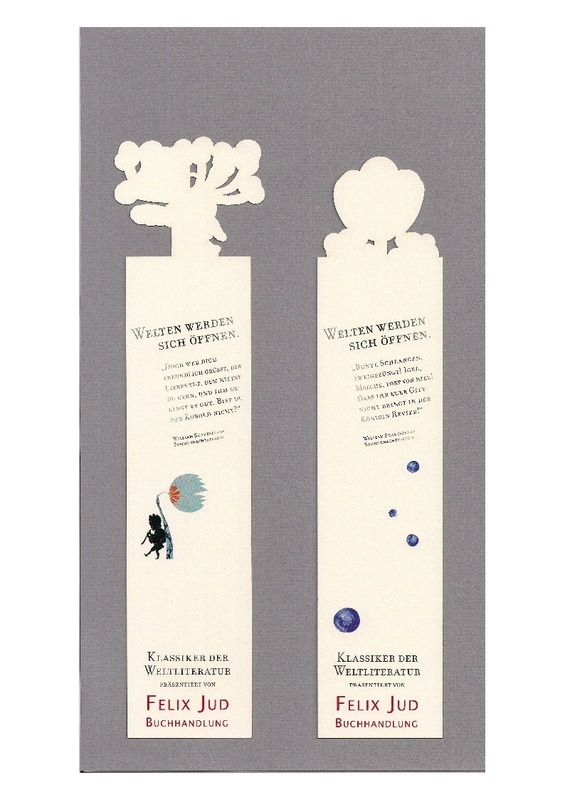 Fortunately, I met very kind and helpful people there and they promised me to search in the next days for a person in the company who was involved in the Felix Jud project back in 2010 and to send me the bookmarks in case some of them were still available. Days later, the postman I was awaiting so impatiently brought an envelope. 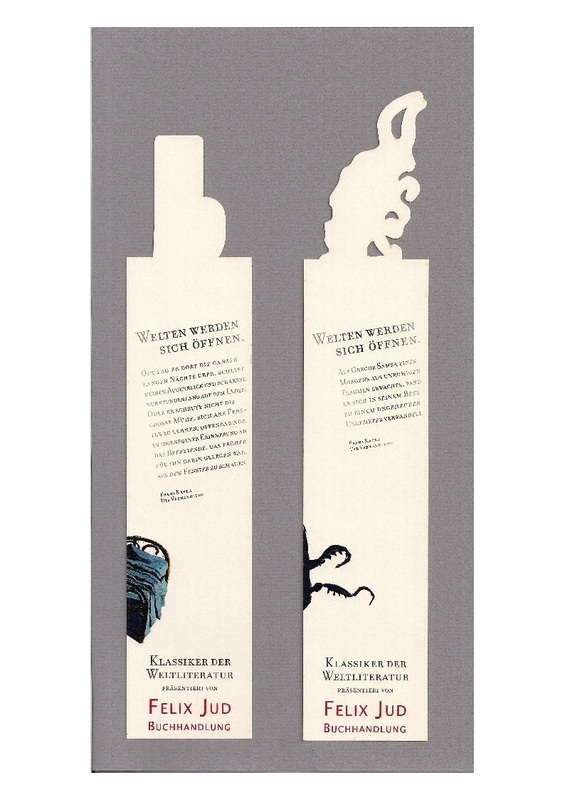 To my surprise, not only the four Kafka bookmarks, but a whole series of 32 bookmarks were enclosed! I guess you can imagine my pleasure and delight. 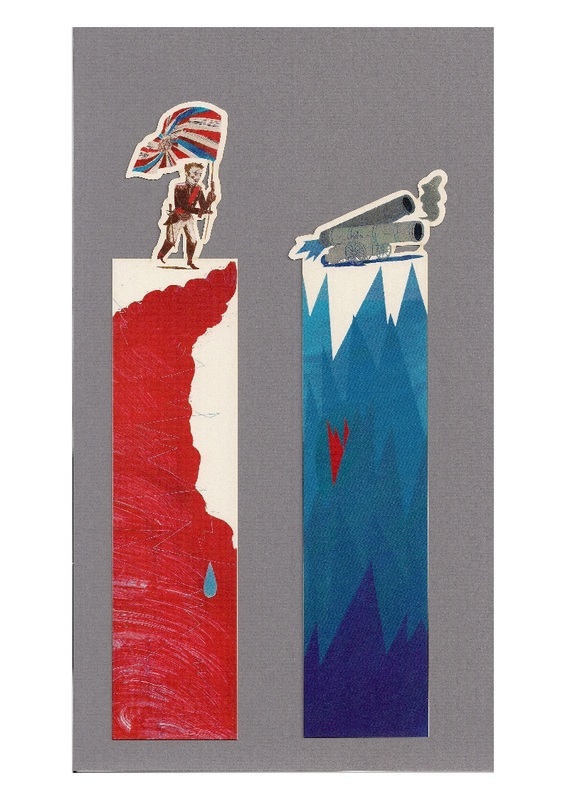 In their search they had came across Vicky Jacob-Ebbinghaus who was not only involved in the Felix Jud campaign, but also was the creator of the bookmark idea. 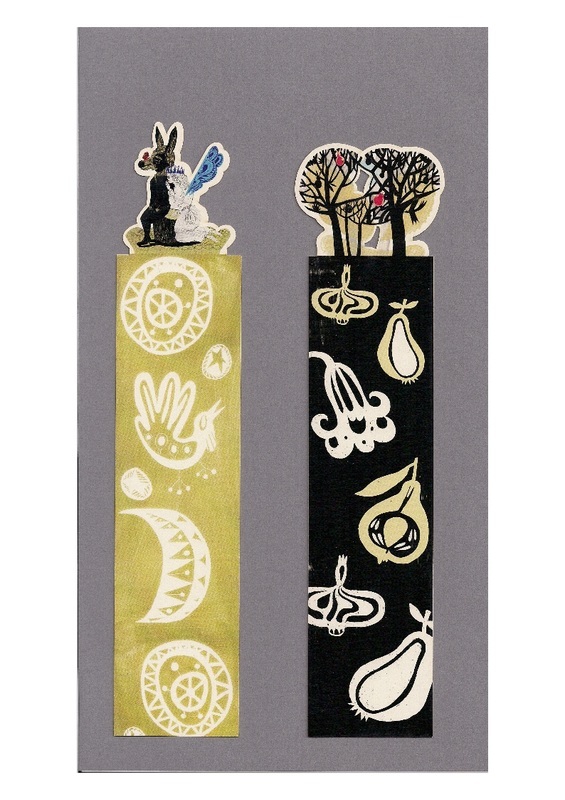 Her understanding for an enthusiastic bookmark collector like me was so great that she was ready to make to me a gift by sending her whole set of 32 bookmarks which she had kept in her specimen collection. I was impressed, thankful, and completely happy. 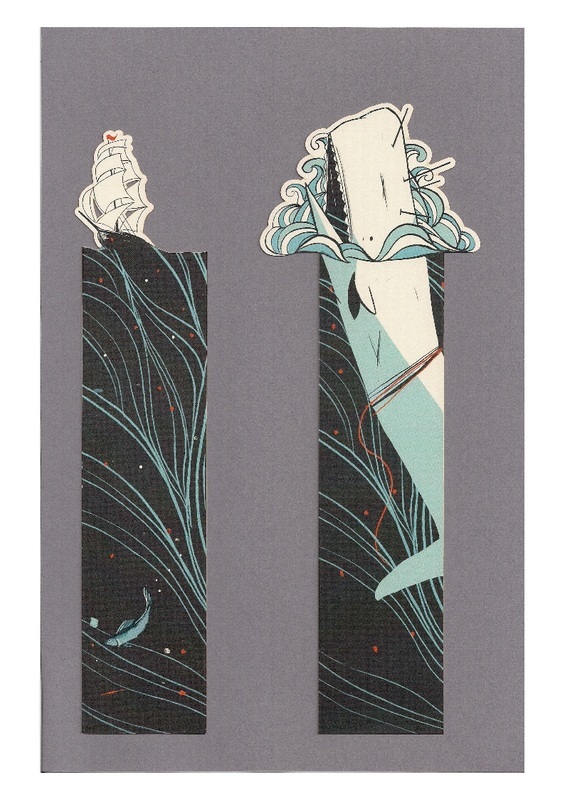 The 32 bookmarks I received were of exceptional beauty. The agency Scholz & Friends had made an admirable job, and I was fascinated. I delved into the internet to know more about my treasure. A new cosmos of advertising branch opened up in front of me. 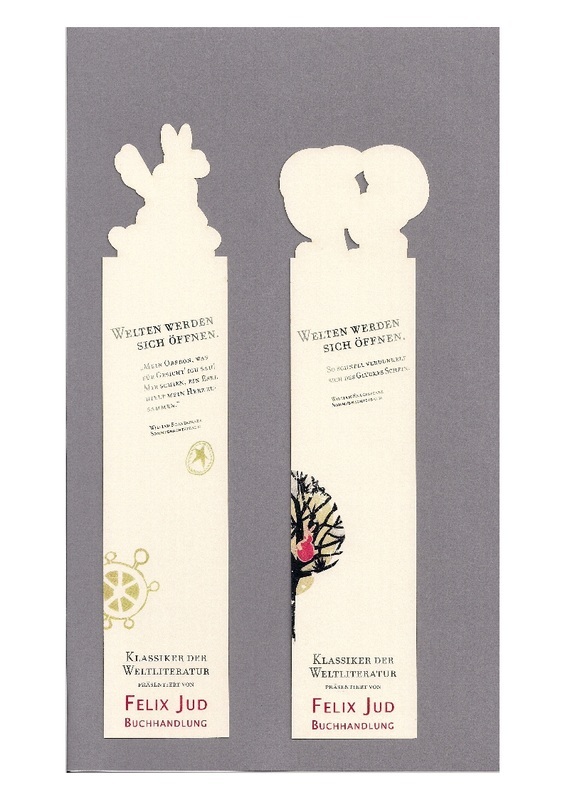 I saw that a huge team was involved in the production of the bookmarks, including two creative CEOs, two creative directors (Suze Barrett, Dennis Lück), two art directors (Joanna Broda, Katharina Uelsberg), a person responsible for graphics, a copyright manager and the creator of the idea (my sponsor), and a few more. 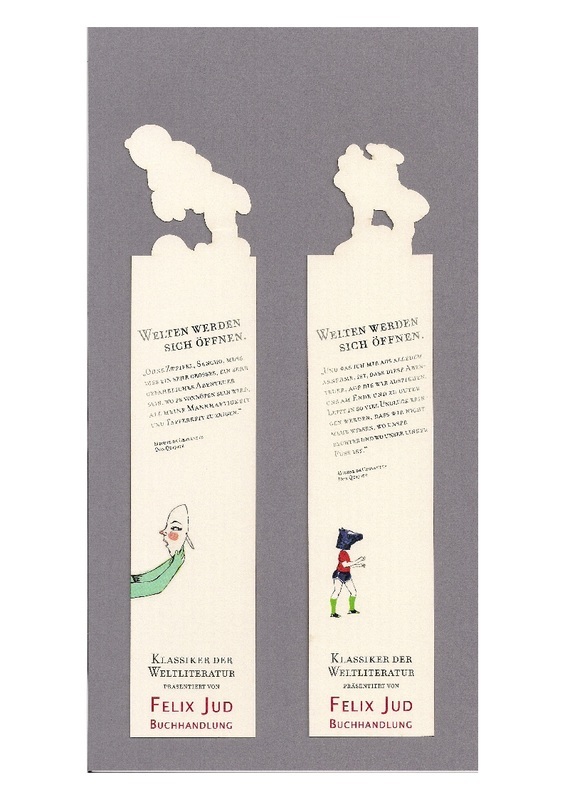 It was amazing for me that for the production of bookmarks so many persons were needed. And that was not all. 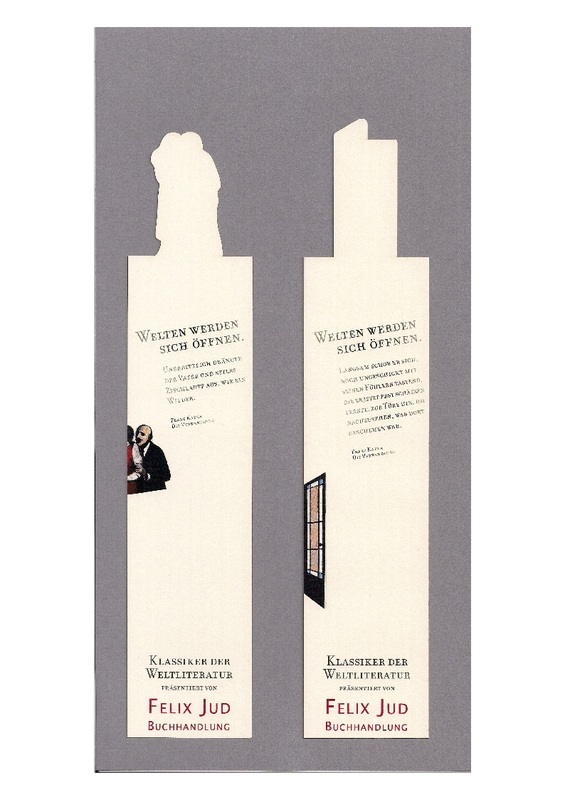 Two external companies were also part of the project team, and one of them, the agency 2Agenten Schwarz & Wendt in Berlin, was commissioned with the illustrations. 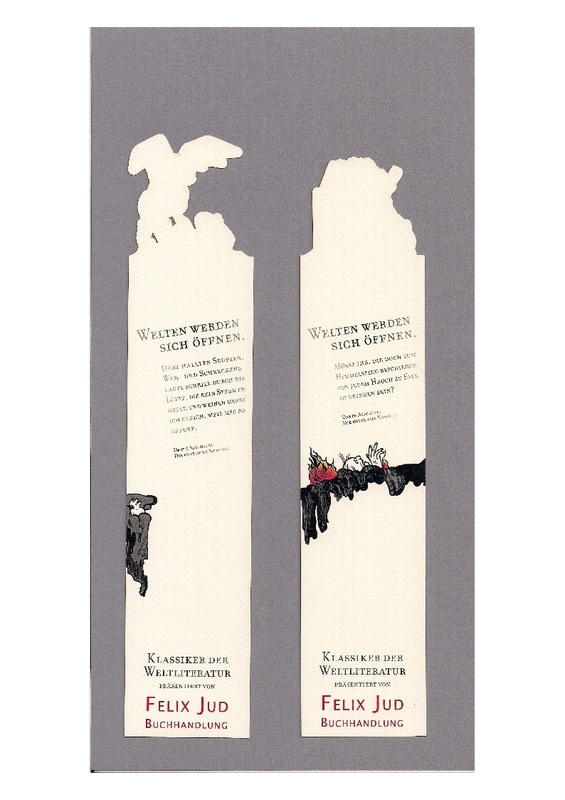 2Agenten Schwarz & Wendt is one of the most important agencies for illustrators in Germany. They represent over 30 artists from various countries and have worked for many renowned companies all over the world. 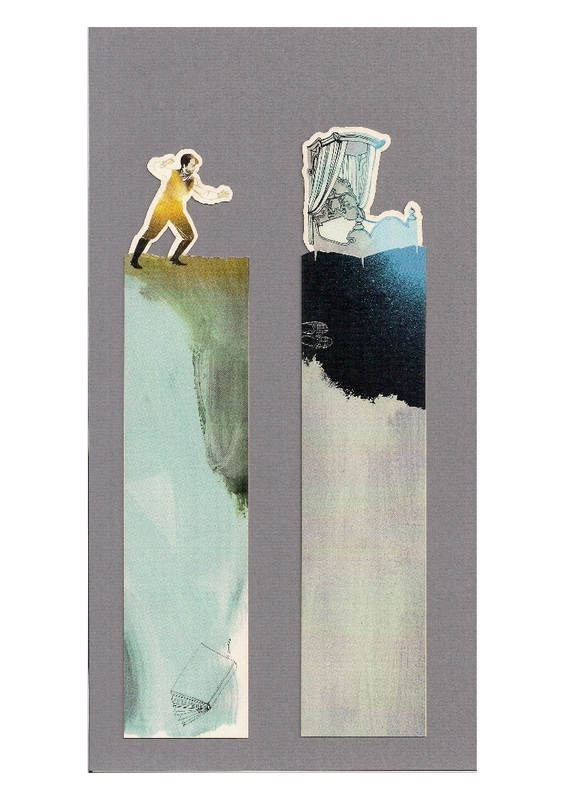 Browsing through their website with sample illustrations by the artists working for them is a great pleasure if you are interested in illustration and graphic design. 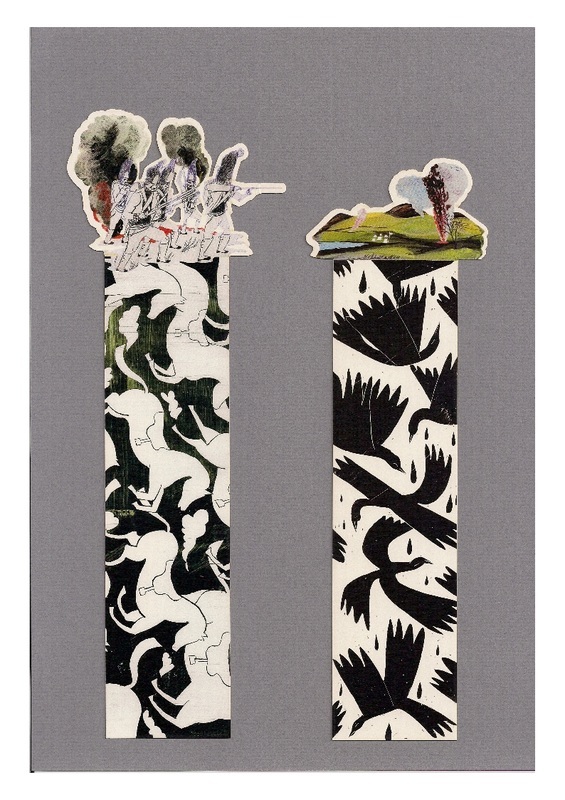 Each four of our bookmarks devoted to one of the eight literature classics mentioned above were created by a different artist, except one artist (Romy Blümel) who was responsible for two groups. 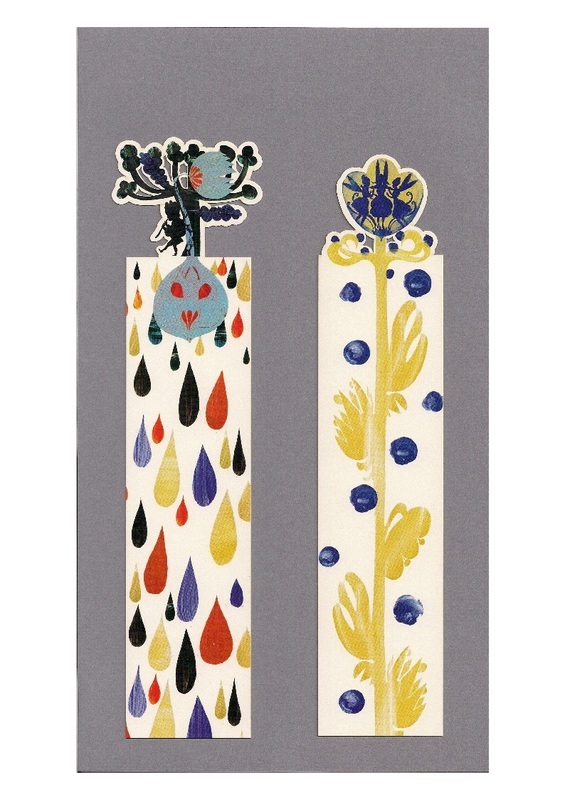 The seven artists used different techniques like watercolours or collages, which resulted, of course, also due to their individual illustrating styles, in rather different artwork for the bookmarks, and thus to a bunch of distinctive and delightful bookmarks. 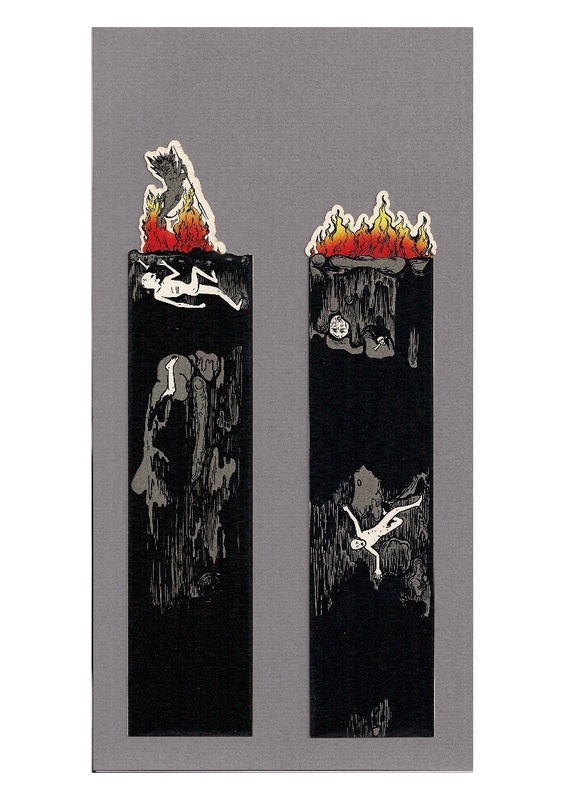 If you like some of the bookmarks particularly you may wish to have a look at the websites of the corresponding artists to see more artwork done by them. 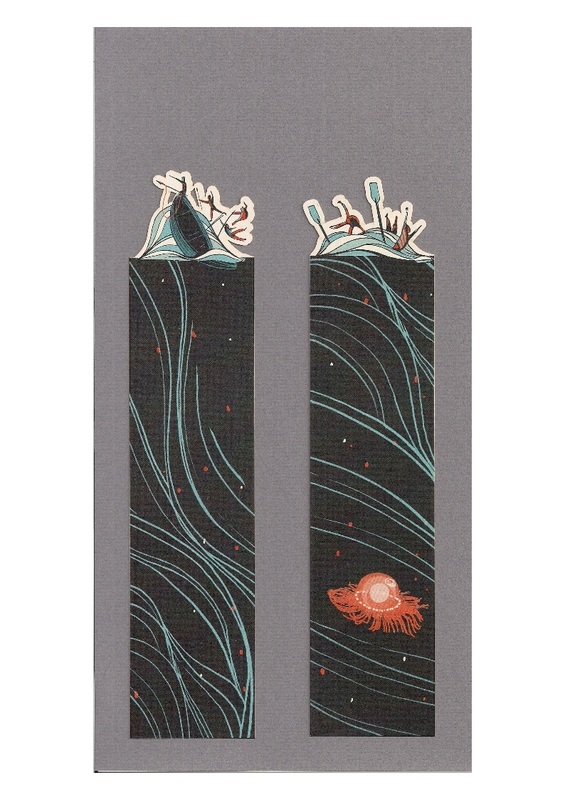 I was not alone with my enthusiasm for the beauty of the bookmarks, as I found out. 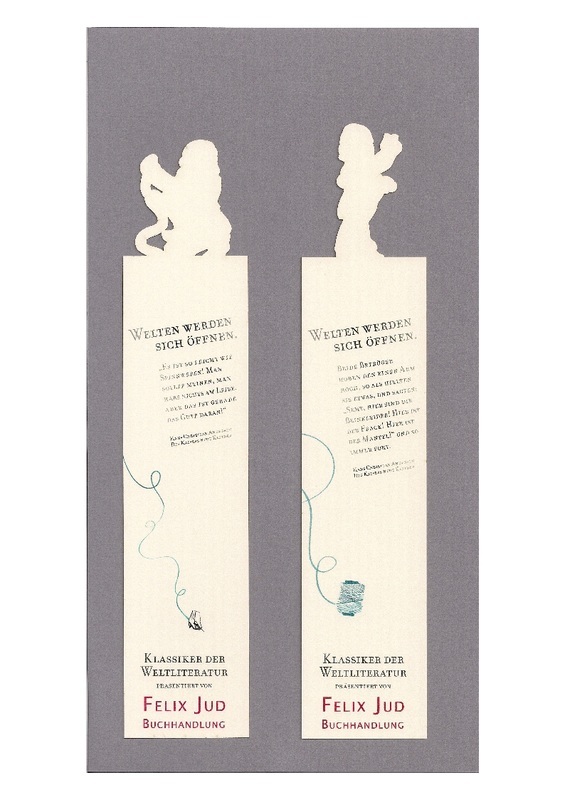 The Art Directors Club (ADC) in Germany has awarded the bookmark campaign of the agency Scholz & Friends with a silver nail in the competition category Design/Individual Graphic Artwork in 2010. The ADC is an association of leading art directors in the advertising trade and was founded 1920 in New York with the aim to promote the highest quality in advertising and the younger generation. They have national branches in various countries and stage competitions every year to award the most creative works of the trade with gold, silver, bronze, and pink nails. The ADC awards represent one of the most prestigious prizes in the communications sector. 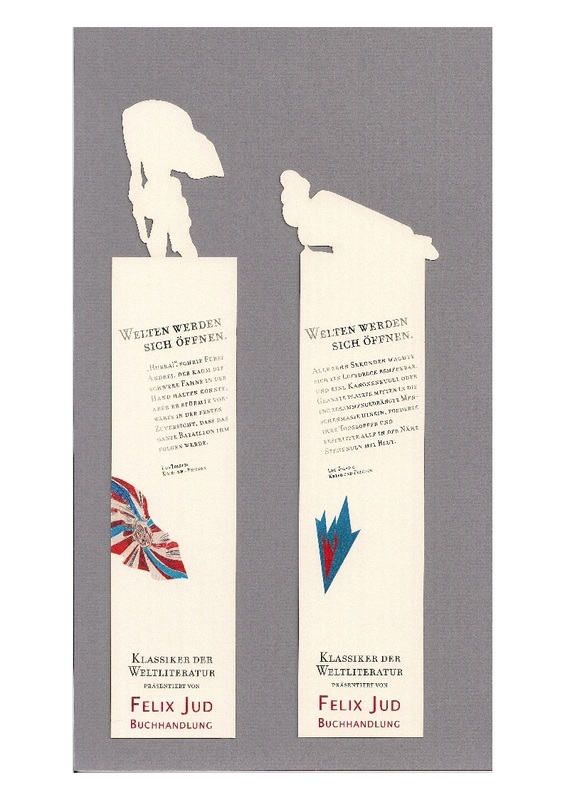 The bookmarks display on the back quotes from the respective books and scattered pieces of images matching the front side. 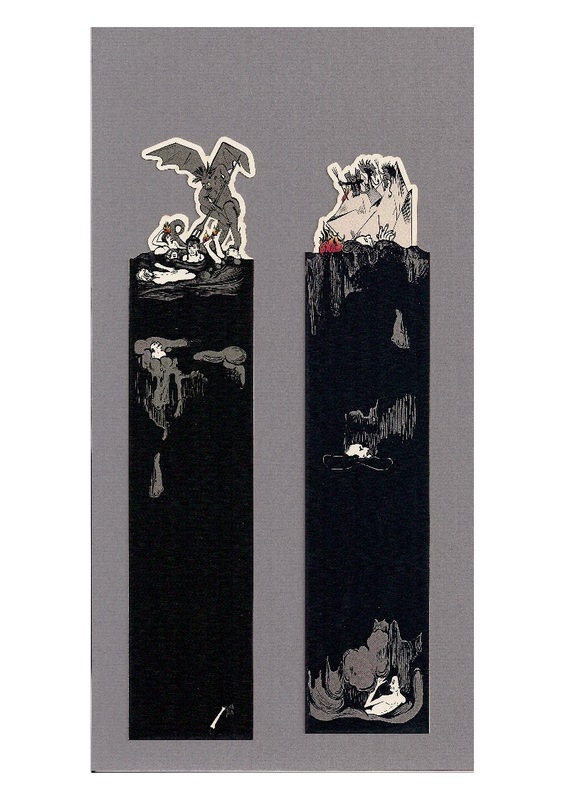 The rectangular body of the bookmarks have been cutout around the illustrations with pleasing detail. 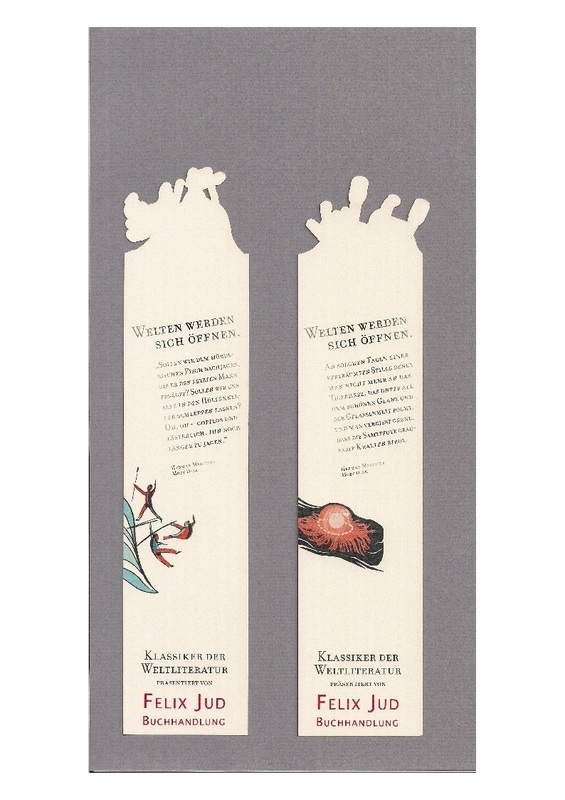 This overall design lends to the individually so different bookmarks a corporate identity and helps to recognise them at first sight as members of the group. 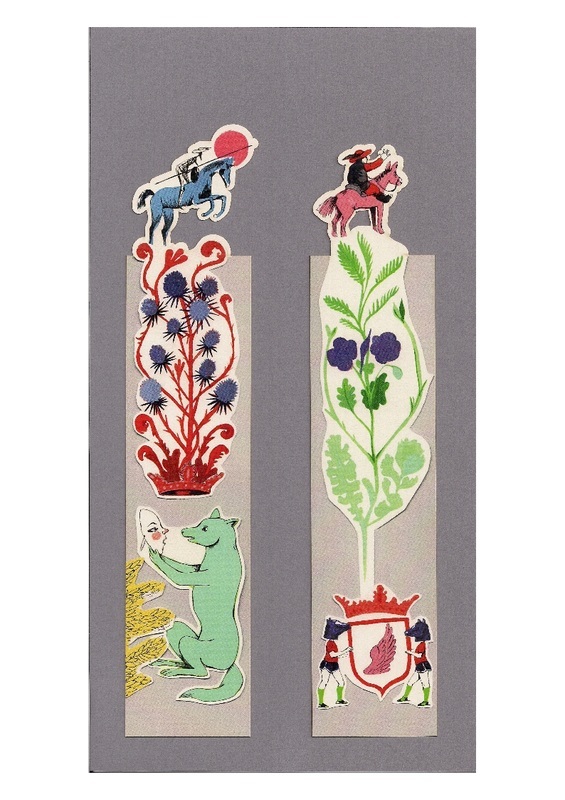 I am glad that I have found so much information about this charming set of bookmarks, enough to write an article about them. 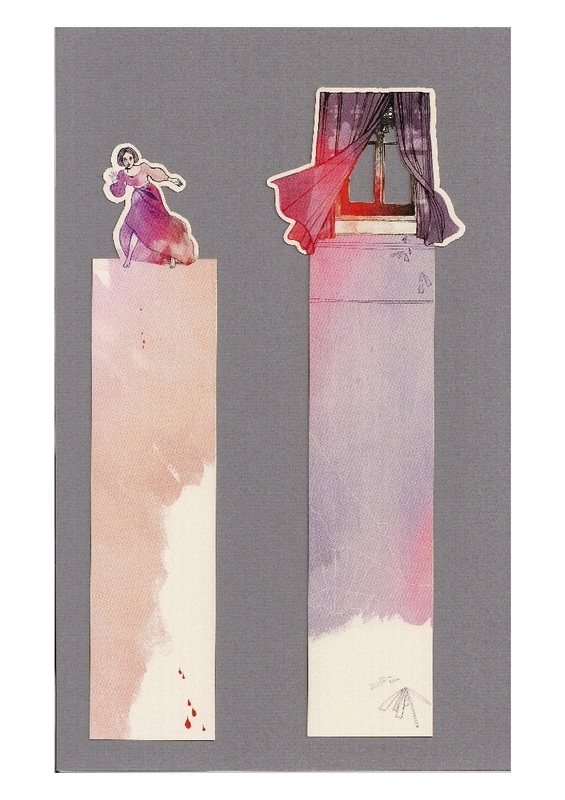 Sharing the delight about attractive bookmarks with collector colleagues and other people who might be inspired to start their own bookmark collection is a very exciting and fulfilling experience. I hope this publication may encourage my colleagues to share their treasures with us, I would appreciate it very much. 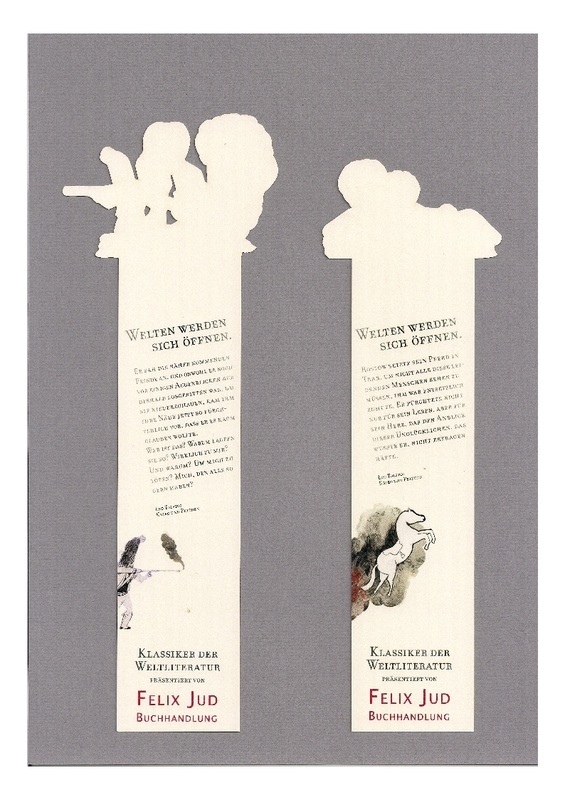 ​At the end, I wish to express my sincere thanks to the bookshop Felix Jud, Hamburg, to the agencies Scholz & Friends, Hamburg, and 2Agenten, Berlin, as well as to the involved artists mentioned in this publication for allowing me to make use of their copyrighted publications and artwork. My particular thanks go to Asim Maner from the editorial team of the IFOB for his detailed consultancy during the creation of this article and for his kind help in editing my text.